Debut cycle to work complete! I cycled with my good friend, colleague and running partner Kelly Newman, Corporate Marketing Manager here at Nottingham. We were kindly escorted by her husband Chris who’s a keen cyclist and winner of the Nottingham leg of Life Cycle in 2011. People seem much nicer on bike than by foot (a generalisation I know). I exchanged five chirpy, “good mornings” in the 2 miles it took to get to Kelly and Chris’ house. Each of them smiled and I smiled back. I imagine this will be the complete opposite on the way home. We’ll see! Upon arriving on University Park I didn’t quite realise how many places there were to park up. I guess you don’t really notice them until you become a cyclist yourself. 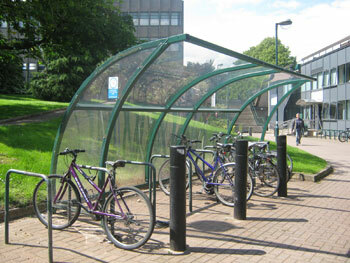 In fact, within 1 minute of my office (in Pope Building) there are over 260 spaces to lock up your bike. I’ve been thinking, and as a challenge to myself I might enter the 55 mile ride from Nevill Holt to University Park for Life Cycle 3 on Sunday 1 September 2013. I’m going to see how my 30 mile ride this Sunday goes first though. Actually, I’m told that anyone wanting to register or find out more about Life Cycle 3 can come along to May Fest on Saturday 18 May 2013, the University’s free open day. Shame how when it’s sunny there are no where near enough cycle parking spaces. And then when I have to park it against a railing I get a notice saying it will be taken away. We need more cycle parking spaces (And undercover ones at that!) near the engineering department. Good luck with your cycling though! I agree, later on in the day it seems impossible to spot any spare spaces. Do you find there is an issue with finding an available shower also?